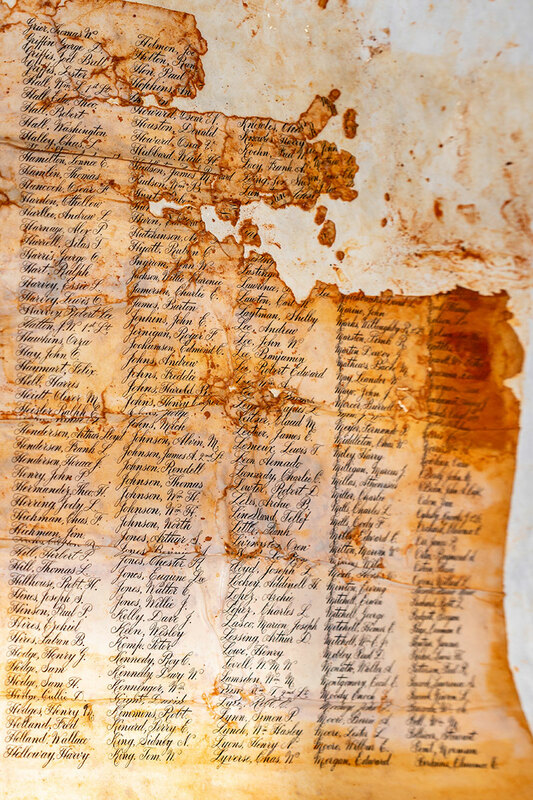 Digging up history in Memorial Park - The Resident Community News Group, Inc. | The Resident Community News Group, Inc.
A soggy wad of parchment displays some of the names of 1,220 Floridians who served and died during World War I. Nearly 94 years ago on Christmas Day, a Jacksonville Citizens Committee put a parchment scroll, onto which 1,220 names of Florida men and women who died serving in World War I had been beautifully inscribed in India ink, into a lead box. They soldered the box shut, put that box into a bronze box, soldered that box shut, too, and buried both in Memorial Park in front of the statue, “Spiritualized Life.” On top of the box they placed a plaque honoring the dead and walked away, certain that their work would be good to protect the scroll for a hundred years. In 2017, Hurricane Irma was almost their undoing. A year later, on Sept. 27, volunteers with the Memorial Park Association, a nonprofit group that works to preserve the riverfront park in Riverside, removed the boxes. 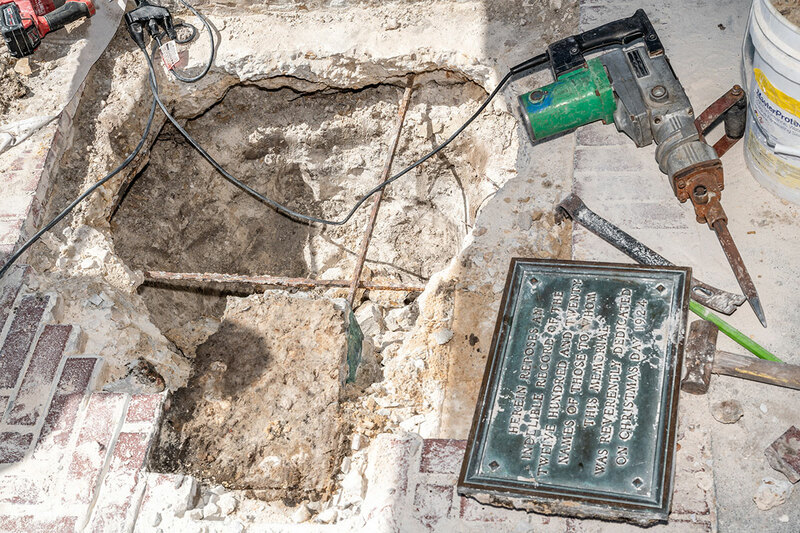 The purpose of unearthing the lead box was to reveal the 1,220 names of the Florida Fallen and compare them to nearly 1,600 names, identified from various sources by Dr. R.B. Rosenburg of Clayton State University in Morrow, Georgia, who has been researching the Florida World War I dead. The Memorial Park Association plans to add the names of more than 300 additional men and women discovered to have died in the “Great War” to a new list and re-bury the boxes. 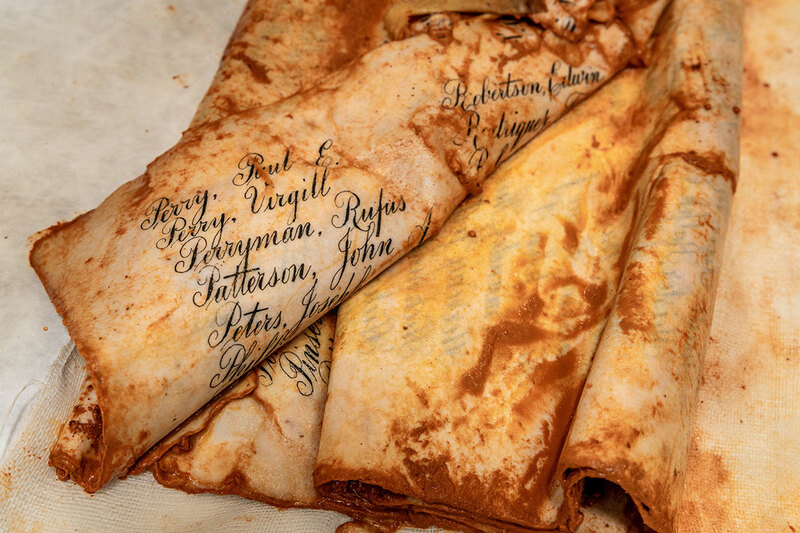 The original scrolls will be on display at a location yet to be determined. 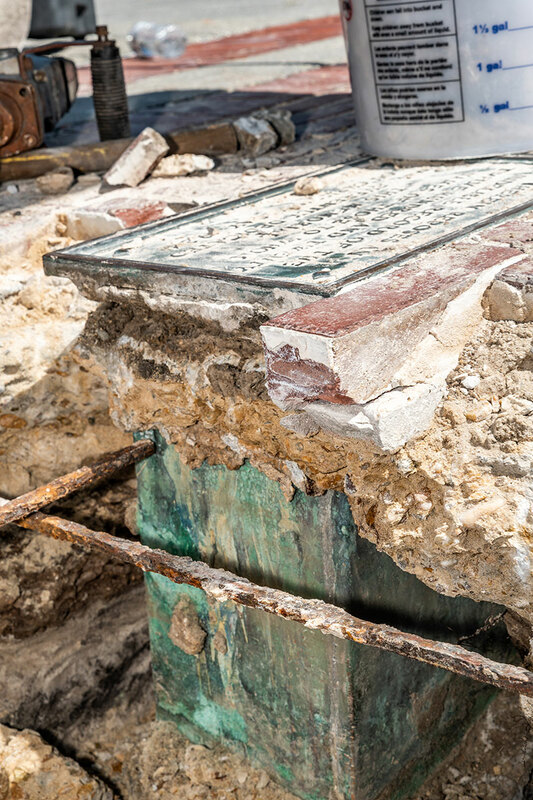 After the boxes were unearthed, the outer bronze box was successfully opened by members of the Jacksonville Fire & Rescue Department and St. Augustine-based Ann Seibert, who retired in 2016 as deputy director, Preservation Programs for the National Archives, and who previously worked in paper preservation for the Library of Congress. When they started to open the top corner of the inner lead box, they noticed a small amount of rust. Seibert feared water from flooding caused by Hurricane Irma had gotten inside and may have damaged the parchment. The lead box was immediately taken to the Archaeological Maritime Lab at the St. Augustine Lighthouse where Seibert and Starr Cox, director of Archaeological Conservation, St. Augustine Lighthouse Archaeological Maritime Program, discovered a second smaller parchment folded inside the larger parchment. “Seibert is incredible; the patience she has to have to mend the paper is amazing. Although all the records indicated the names were on parchment, they are actually on paper,” said Michele Luthin, MPA vice president at large. “Ann discovered the watermark while she was cleaning the pages. She is mending the pages now and after she is finished with that she will place them in a secure medium (probably a plexiglass type thing), so they can be displayed and moved without causing further damage. 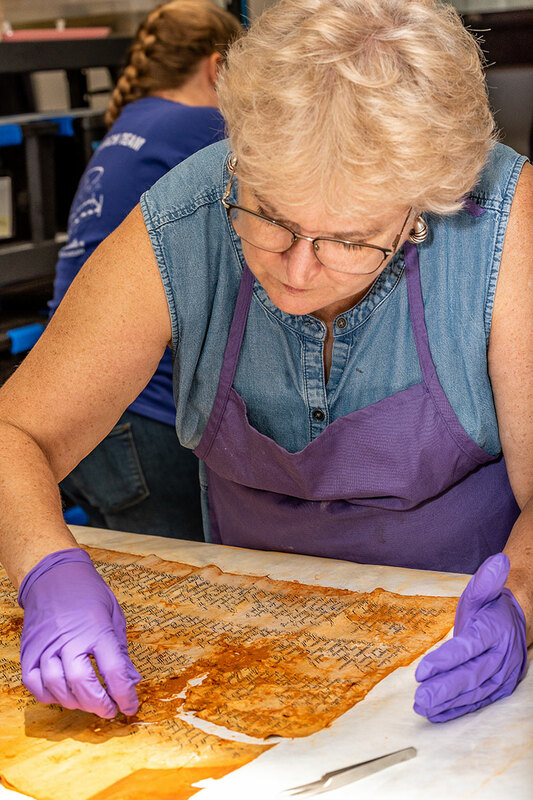 Dr. Rosenburg believes that the intent behind how the names were listed on the six parchment pages found in the box was to separate them by race and by branches of the military. The first three pages have larger writing and the names are almost of all white male members of the U.S. Army. The fourth page has smaller-sized names of members of the Marines and Navy, as well as five YMCA workers, including the only woman listed on the scroll. The fifth and sixth pages are all names of black members of the service who died during World War I. The page that the association originally thought was a second scroll was probably originally attached to the second page, not a separate scroll. “I have names of more women who held a rank within the Navy and served in the war, but they weren’t listed on the scroll,” Dr. Rosenburg said. He now has a list of nearly 1,600 names with 40 more possible names of Floridians who died during World War I.
Dr. Rosenburg is searching for more information on each name, such as residence; when, where and why they entered the service and into which service; birthplace; birthdate; last assignment at the time of their death; cause, date and place of death; next of kin; and other details. “About 75 percent of those who served in World War I died of bacterial and viral infections, not from being killed in action or wartime wounds,” he said. He has found the names of three brothers and several other sets of brothers. At least three names on the scroll are related to him, he discovered. He discovered personal stories about some of the people listed, such as Fred Safay (listed as Safey on the parchment). Safay, whose family was originally from Syria, was born in Jacksonville on May 15, 1889. After serving in the U.S. military for six years in two different Calvary units, he entered World War I in a Canadian regiment out of Quebec in 1915, before the war started. He served until his death in 1917 in Belgium where he is buried. Dr. Rosenburg will discuss other interesting findings from his research at a free lecture Saturday, Nov. 10, 10 a.m., at the Garden Club of Jacksonville, 1005 Riverside Ave. All the names will soon be available at MemParkJax.org. Memorial Park, located at 1620 Riverside Ave., opened in 1924 as a World War I memorial, thanks to the vision of Rotarian George Hardee. On Nov. 12, 1918, the day after an armistice ending World War I was signed, a Citizens Committee was formed to raise funds, and on Dec. 25, 1924, the park opened. Designed by the famed Olmsted Brothers, it is the only park in the state dedicated to the Floridians who lost their lives in service during World War I.